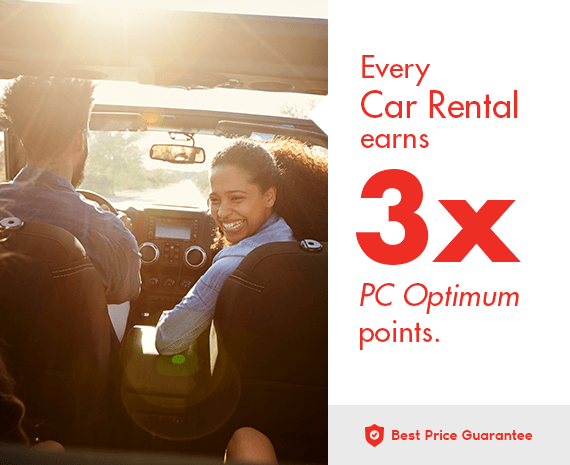 We’ve made it easy to find your perfect car rental whatever your budget. Simply choose your pick up point, from the thousands of​ locations available worldwide and your travel times and we’ll show you the vehicles available. You can then quickly narrow down your search results using filters, so whether you need a compact vehicle with room for 2 bags or a luxury vehicle, with air conditioning and 4WD you’ll find it just a click away. benefits and perks while you enjoy the things that make life better. Sign up to be entered, plus receive special offers, news and more delivered straight to your inbox. I agree to receive commercial electronic messages such as email about the products and services offered by Travel Nation Canada regarding PC™ travel services. I may later unsubscribe. I may contact Travel Nation Canada at 2810 Matheson Blvd. East, Suite 300, Mississauga, Ontario, L4W 4X7, or at inquiries@pctravel.ca. I also agree, if I am eligible, to be entered into the $1000 weekly prize draw and agree to the contest rules. The contest is not open to Quebec residents. See contest rules for full details including other eligibility restrictions. I agree to receive commercial electronic messages such as email about the products and services offered by Travel Nation Canada at 2810 Matheson Blvd. East, Suite 300, Mississauga, Ontario L4W 4X7, or at inquiries@pctravel.ca. I also agree, if i eligible, to be entered into the $1000 weekly prize draw and agree the contest rules. The contest is not open to Quebec residents. See contest rules for full details including other eligibility restrictions.